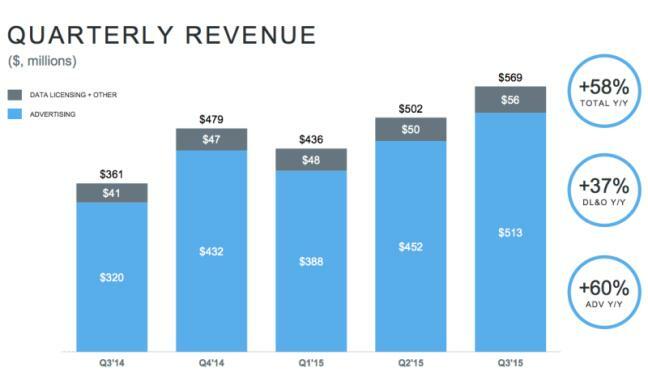 Twitter has revealed its Q3, 2015 earnings report under the leadership of its new CEO and Co-Founder Jack Dorsey. 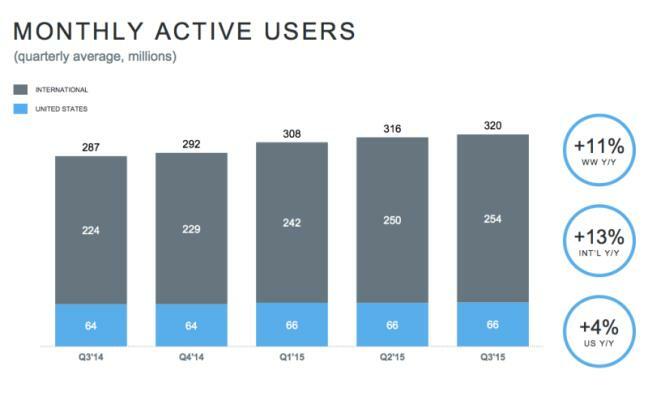 Twitter’s slow growth continues and US remained flat at 66 million, the same number was reported in the first quarter. The report won’t make Wall Street happy but investors will have to have faith under the new leadership. The social network reported that user growth was up only four million from the second quarter, for a total of 320 million. The total is only 307 million when you discount “Fast Followers,” the people mostly in the developing world who sign up using SMS. While there is a very small growth in International waters for Twitter, US has been a surprise for the network considering it is a developed market. There has been almost no growth from Q3, 14 but if you see 2015’s previous quarters the growth has completely stopped. However, there is good news at least on the revenues aspect, as in the last quarter. The company reported $569 million in revenue for the third quarter, which beat the Wall Street consensus of about $560 million and was up 58 percent over the third quarter of 2014. Advertising revenue was up 60 percent to $513 million, with 86 percent of that total coming from mobile advertising. In comparison, 88 percent of ad revenue came from mobile ads in the last quarter. But the company lowered revenue projections for Q4, from the $740 million analysts estimated to between $695 million and $710 million. Post this Twitter’s stocks were down as much as 12 percent in after-hours trading. Over time Twitter has tried hard to simplify the product or even tried mimicking Facebook at various occasions. The recently concluded Flight, Twitter’s developer conference had interesting product updates. But Twitter is betting heavily on Moments – curated news or stories unfolding on Twitter. A product that has been built with marketing in mind and to tap the young generation that is hooked to apps like Snapchat, Instagram, WhatsApp, etc. According to the latest Pew Survey: young Americans continue to be the most likely to use social networks, according to the survey, with 90 percent of those 18 to 29 reporting they use at least one social site. Besides 35 percent of those 65 and older use social media, more than three times the 11 percent who reported social use in 2010. Moments entirely focuses on helping people find and digest great content and stories, on any topic. It also reflects an opportunity with this new product for marketers who would like to reach out to a set of audience who are on the lookout to discover new information, ideas, and stories. To spike up user growth first in US and sell Moments, Twitter is going the old-school marketing way by launching a national TV advertising campaign tonight during the World Series. The first ad, called “Post-Season,” is a 30 second commercial to introduce Twitter’s new Moments feature to sports fans. The ad highlights scenes from the Major League Baseball playoffs — Jose Batista bat flips, cursed Chicago Cub goat GIFs, spectacular catches in the outfield — as they appeared within tweets. The agency behind the spots is TBWA\Chiat\Day; Chiat\Day which famously created the “1984” ad that introduced the Macintosh for Apple, reports Verge. Targeting young people, Anthony Noto, Twitter’s chief financial officer, told in an interview to The Verge that the campaign’s goal is to let targeted segments of potential users see the stuff that’s on Twitter every day. Meanwhile, Twitter has identified five core groups of people who don’t use Twitter — it would only share two with me, sports enthusiasts and the 18- to 24-year-old women it calls “social connectors” — and Moments is designed to appeal to them, informed Kathryn Apte, who leads consumer product marketing at Twitter. Twitter’s campaign also extends beyond TV — it’s doing paid search and mobile app install ads as well, including some on its own platforms. Will TV work for Twitter is something Q4, 2015 will tell. But for now Twitter has no choice other than a mass-media approach and showcase Twitter’s potential to spike the user growth first in US. Otherwise at some point the stagnant user growth will hit its revenues.